Troubled skin? 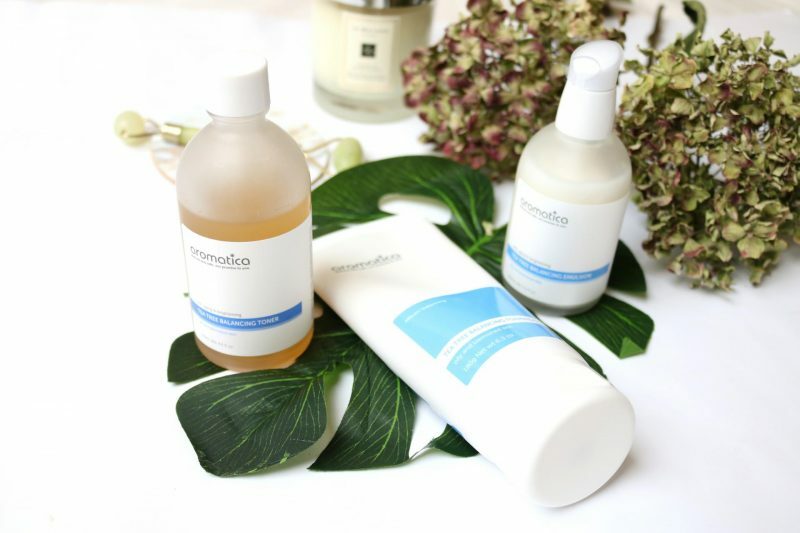 Try the Korean Aromatica Tea Tree line! I received these lovely Aromatica Tea Tree items from the Dutch Korean webshop named Ippo Cosmetics. The owner Hyesun is the most amazing person I’ve ever met! We occasionally meet each other paired with some amazing delicious food. A collaboration is not all about selling items, but also the relationship between the brand and person. To me it is more important to have that connection so you can really stand behind the product you are presenting. For today I will share you my experience with the Tea Tree line from the Korean brand Aromatica. As an oily skin girl with troubled skin I’m always looking for new skincare items to help recover my skin. Come take a read! 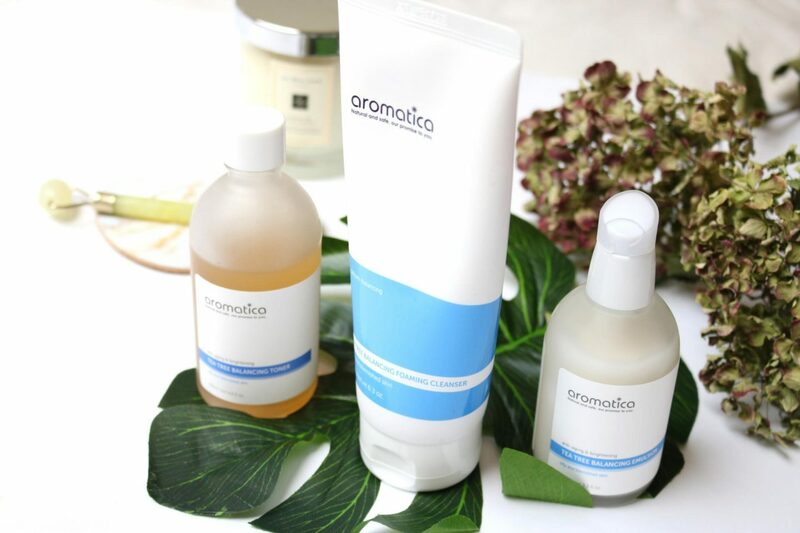 Natural and safe, our promise to you is the motto of aromatica (with the small ‘a’). 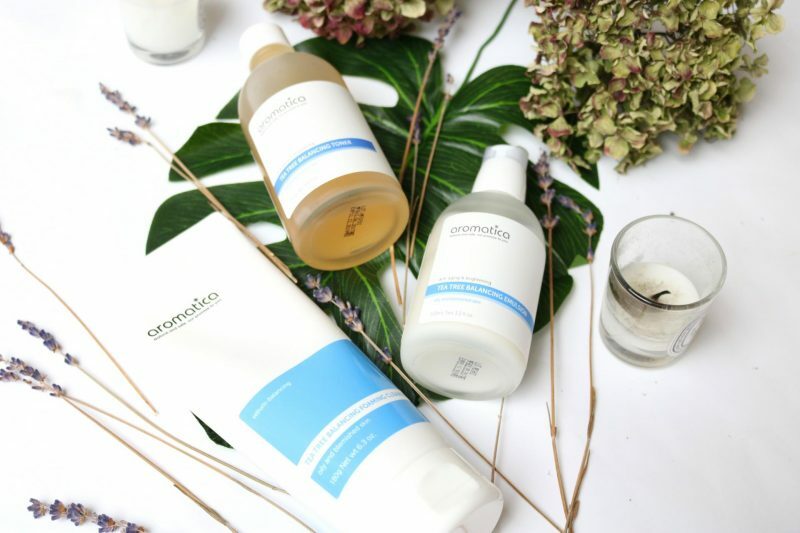 Aromatica is a brand with EWG Certification for cosmetics safety and Ecocert certification for organic sources. It’s Vegan and cruelty free! 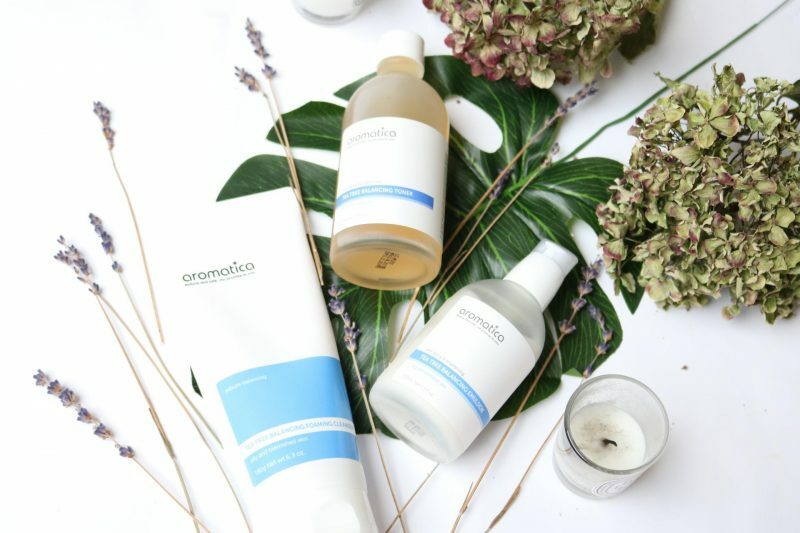 If you are looking for a skincare brand that can promise you that they won’t harm the environment than aromatica would be the one. I think that there are only a few Korean skincare brands that can offer what they do. I became a big fan of the brand when Michelle Phan was trying their products. If I can remember it clear she used the Rose pink line which is for a dry and aging skin. I’m not yet at that age that I will use anti-aging products constantly but it may come one day (or this year). Aromatica Tea Tree Balancing Toner is a refreshing organic toner that contains 80.9% of Tea Tree Leaf Extract. Tea Tree Leaf Extract is very effective to control excess sebum and soothes skin with breakouts. Aloe Vera Extract gives this toner extra hydration so that your skin feels most comfortable. This organic toner contains certified organic ingredients and natural essential oil. Light citrus scent from Verbena and Bergamot oil makes this toner extra fresh and pleasant to use. This has to be my favorite product out of this set! Why? Because when I use this toner during the morning, I can really feel that it takes away all the excess oil and sebum and it makes my skin feel calm. When I have breakouts around my jawline the toner will gently dry out the pimples. I never had that my pimples started to get bigger or worse when I used the toner. During my morning routine it is important to prep my skin for the entire day and how amazing is it when this toner makes my skin feel clean and fresh. I know, you may think your toner will do the same. To me I can really feel the difference between the aromatica Tea Tree Balancing Toner and my other favorite one from Klairs (review). With the Klairs my skin feels smooth and moist, which is great if you have dry combination skin. But for me I can only use this toner during my night routine because it may cause some excess oil during the day. I just can’t handle anything that gives my skin an extra glow or hydration, that is something I prefer during my night routine. 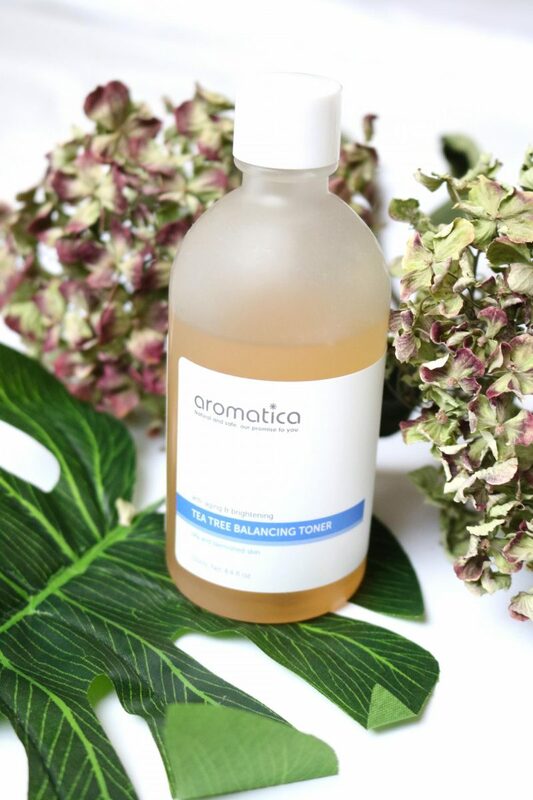 The aromatica Tea Tree Balancing Toner can be used day and night and is just simply the best toner I ever had! Ippo Cosmetics, can I have a life time supply of this toner haha! Apply generous amount on cotton pad and apply to face and neck. For best result, combine with Aromatica Tea Tree Balancing Foaming Cleanser and Aromatica Tea Tree Balancing Emulsion. This product is suitable for oily skin, sensitive skin and acne prone skin. 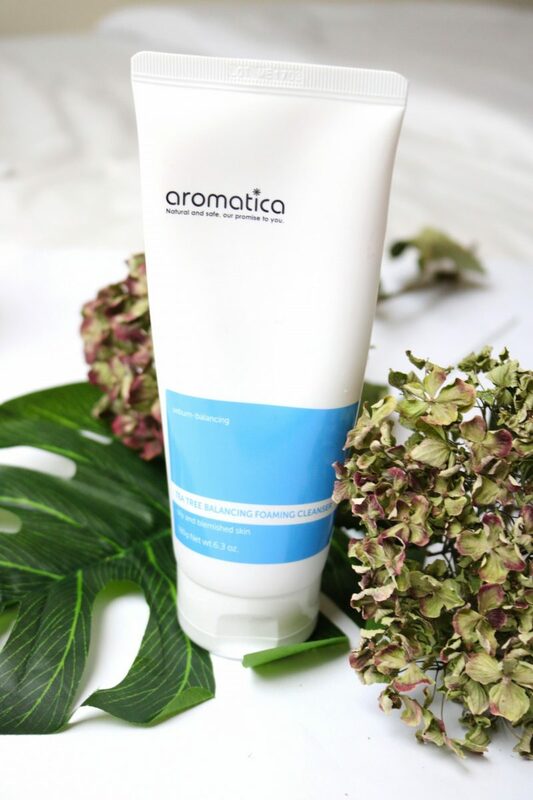 Aromatica Tea Tree Balancing Emulsion is a light fluid cream that contains Tea Tree Leaf Extract and herbal extracts to hydrate and nourish acne prone skin. Tea Tree Leaf Extract effective regulates excess sebum and fights again breakouts while other natural herbal ingredients sooth irritated skin. This gentle emulsion will help you to recover from acne and prevent new breakouts. The cream texture is very light and absorbs quickly and doesn’t block pores. This product comes in hygienic bottle with a pump, so it is easy to use and product will remain clean and safe till the end of the bottle. This organic emulsion contains certified organic ingredients and natural essential oil. It has a refreshing neutral herbal scent which makes it great for both men and women. This product is highly concentrated and lasts really long, worth investment for good skin. This was just my second time I used an emulsion in my life (I know right, I’m a disappointment). I avoided the emulsions for a long time because I thought my skin would not need it. I already use an essence in my skincare routine so an emulsion might make skin more oily (was what I thought). Ofcourse it never came in my mind to use an emulsion on its own or as a replacement for the moisturizer. The texture is lighter and gets absorbed faster than a moisturizer. I usually used the emulsion on my days off when I stayed home all day. When applying it on the skin I can instantly feel my skin getting soft and moist without creating that wet/oily feeling. Two pumps are enough to cover your face and neck. Just spread it between your fingers and massage it into the skin. 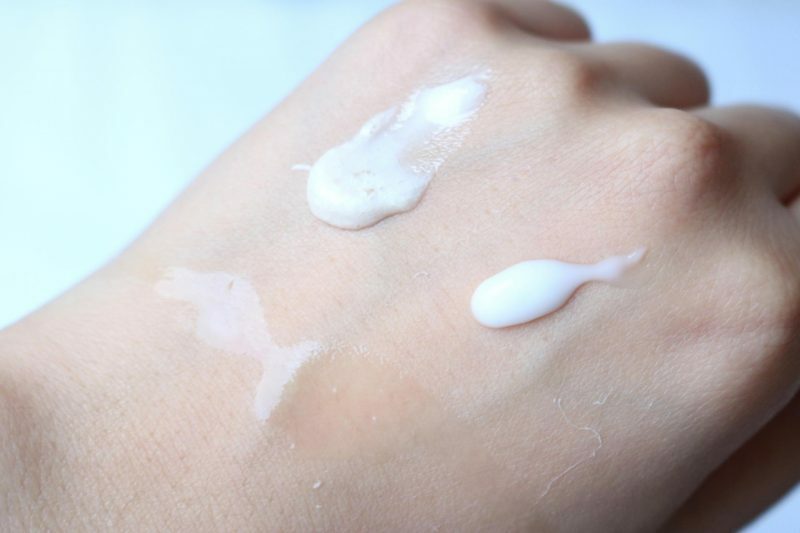 You will be surprised how quick the emulsion gets into the skin and the results: calm skin that feels moist and smooth but without that heavy or sticky feeling of a moisturizer. This would be amazing for my skin during the hot summer days! 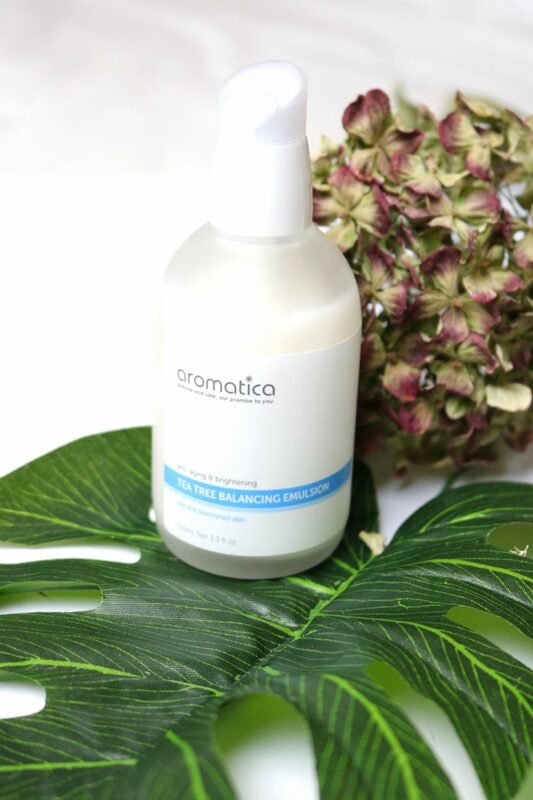 Aromatica Tea Tree Balancing Foaming Cleanser is a refreshing cleanser that contains Aloe Vera Extract and Tea Tree Leaf Extract. Aloe Vera Extract is the main ingredient of this gentle cleanser. It soothes and hydrates skin while it effective removes all the impurities and oil in skin. Tea Tree Leaf Extract is very effective to control excess sebum and soothes skin with breakouts. Your skin will feel fresh, soft and will be in perfect pH balance. No more breakouts with this cleanser! This organic cleanser contains certified organic ingredients and natural essential oil. It has a refreshing neutral herbal scent which makes it great for both men and women. Big size tube lasts really long, worth investment for good skin. Okay, this was clearly my least favorite product for me. When I use a skincare product I expect a great experience with visible results. When I first tried it out I used my Clarisonic Mia 2 to wash my face (review) and the other times with my hands. 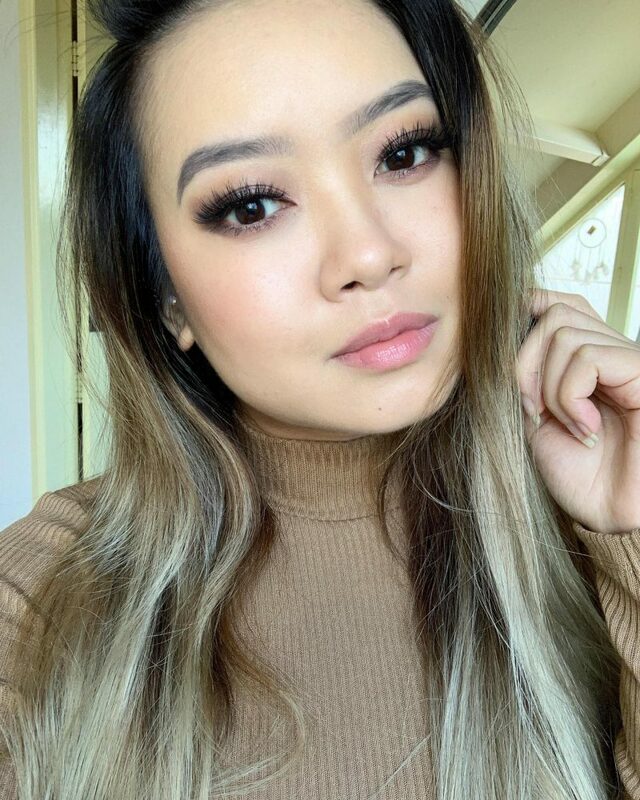 I squeezed some of the product onto my Clarisonic brush and started to make circular motions on my face. Nothing weird happened, untill I washed my face. I used a towel to dry my face and then I suddenly felt something strange: my skin felt like rubber? The texture of my skin felt so weird, like when you touch a balloon. I got goosebumps when I touched my face, but after maybe 5 minutes this effect disappeared. I know that this is a Tea Tree product so it might washed away all the excess sebum and oil which caused the weird feeling, but it was nothing I had expected. I do have to commit that my face, after 5 minutes, felt really good and clean. Mehhh, I told Ippo Cosmetics how I felt about this product and she confirmed she had the same experience. Nothing wrong happened with my skin afterwards, but just don’t touch your face after you washed it for 5 minutes haha! Apply on hands and add bit of water and work into a lather. Massage on your face and rinse off with luke warm water. For best result, combine with Aromatica Tea Tree Balancing Toner and Aromatica Tea Tree Balancing Emulsion. The thicker cream is the cleanser which has a light but textured feeling when you apply it. The fluid is the toner which is by far my favorite! Feels smooth when applying it on the skin and get absorbed quickly. The emulsion is super light, something I’m used to when it comes to emulsions. It is clear that the aromatic Tea Tree Balancing Toner is a must have! Once again, I’m a super oily skin girl so this line may create a different effect on your skin. The toner is my holy grail during those really oily days (usually when I have my period) and makes my skin feel calm. The cleanser is my least favorite because I just don’t enjoy it while I wash my face. It makes my skin feel weird and rubbery. when I use a skincare items and especially when it is a mask or cleanser, the experience has to be perfect for me. 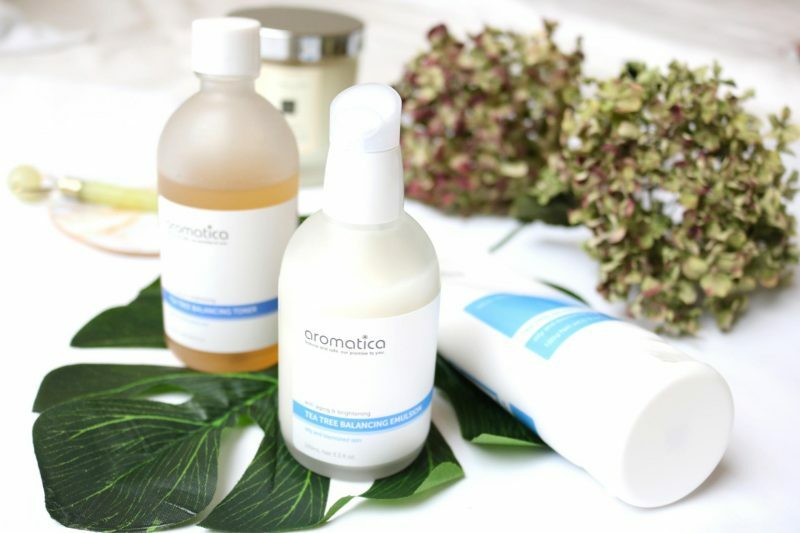 I recommend you to check their other lines they created for different skin types, because aromatica is a Korean brand you definitely have to try! Ippo Cosmetics sells all the lines (pink, blue and green) for the different skin types so check it out. Previous Post Does a Magic Foundation exist? Charlotte Tilbury has it!